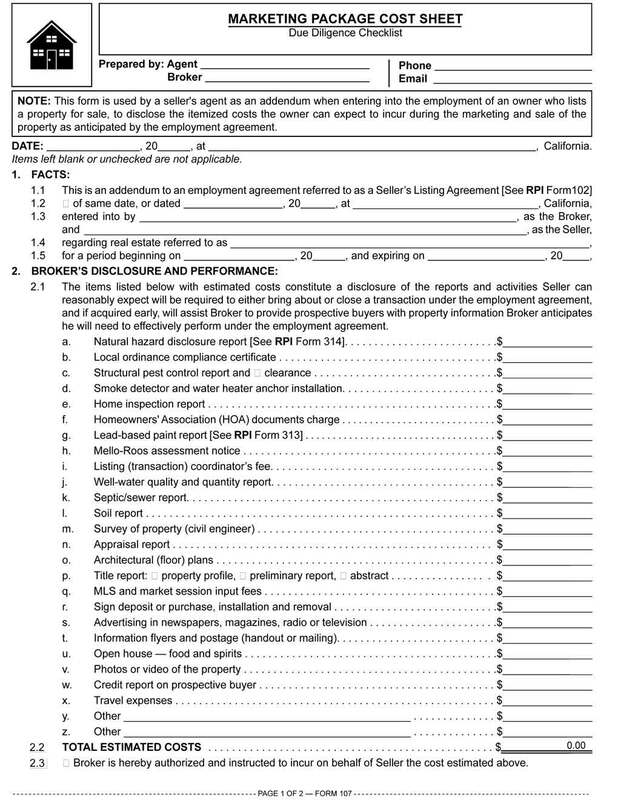 This form is used by a seller’s agent as an addendum when entering into the employment of an owner who lists a property for sale, to disclose the itemized costs the owner can expect to incur during the marketing and sale of the property as anticipated by the employment agreement. As a matter of becoming a licensee, a seller’s agent has learned they owe a special duty to their seller to diligently market their property on the listed terms, legally called a fiduciary duty or duty of a trustee. The sole objective: solicit and locate prospective buyers to acquire the listed property as fully disclosed by the seller and their agent. When a prospective buyer is located, seller’s agents in turn owe the buyer and their agent a general duty to voluntarily and promptly provide critical information on the listed property that might adversely affect its value. This critical information is collectively referred to as material facts. The purpose of this upfront factual disclosure is to put the buyer on notice of conditions, on or about the property, known to the seller or the seller’s agent. Without this property information, a prudent buyer is unable to set a price and make an offer. The property information disclosed by the seller’s agent only needs to be enough to place the buyer on notice of facts. It is the duty of the buyer and the buyer’s age to determine whether the facts may have an adverse consequence on the property’s value or interfere with the buyer’s intended use. For the most efficient delivery of property information for presentation to prospective buyers, the seller’s agent at the listing stage gathers data on the property and organizes it into a marketing package. When an agent deals with any seller, buyer or their agents, documentation by the agent of property information, discussions and negotiations using a form as a checklist is the best practice for avoiding future disputes about what information was transmitted. These reports put a face on the property so it can be better evaluated by prospective buyers and a sale more efficiently negotiated. Negotiations with a prospective buyer requiring full disclosure commence when the prospective buyer or their agent seek out additional information on the listed property beyond the skeletal data contained in a promotional flier. Remember, all property information—third-party reports and disclosures prepared by the seller or the seller’s agent — is included in the marketing package handed to prospective buyers the moment they request more information on the seller’s property than provided by a promotional flyer. The reports received become part of the marketing package the seller’s agent puts together and presents to prospective buyers of the listed property. Prudent agents are aware that fully disclosing the condition of the property “upfront” when first dealing with a prospective buyer is legislated public policy for marketing a property. As a risk-mitigation matter, up-front disclosures avoid further negotiations, or worse, money demands after entering into a purchase agreement when facts are belatedly disclosed or discovered. An agent makes an appointment and meets with a property owner to discuss the owner’s employment of the agent. The discussion includes a review of a listing agreement and its addenda the agent has prepared. One addendum reviewed is a marketing package cost sheet which functions as an itemized list of essential reports and owner activities necessary to advise prospective buyers about the condition and nature of the property. With the delivery of the reports on inquiry from a prospective buyer, the buyer entering into a purchase agreement will be acquiring the property based on their full prior knowledge of its condition. Availability of the disclosures provides a competitive sales advantage over other listed properties that are not marketed with reports to establish their condition. Importantly, when you deliver all reports to the prospective buyer prior to entering into a purchase agreement, closing escrow on the purchase agreement is not subject to the buyer’s further-approval of the property condition disclosures. The primary marketing advantage for the seller whose agent provides prospective buyers with third-party reports is that the sale of the property is transparent at the inception of negotiations — prior to entering into a purchase agreement. The price agreed to in the purchase agreement is based on property conditions “as disclosed” by the reports. A seller’s reaction to their agent’s request for the seller to participate in an aggressive marketing plan by incurring the costs of property reports up front offers the agent insight into just how motivated the seller is to sell the property. The agent’s goal — besides the financial need to list a property and earn a fee — is to encourage and receive maximum cooperation from the seller in their sales effort. A seller may “dress up” the property and enhance its “curb appeal” by cosmetic painting, landscaping and clean up — essential to receiving top offers. However, it is the buyer’s knowledge of the property’s fundamentals which generate firm offers and uncontested purchase agreements. Thus, the seller is asked not only to list the property for sale, but also to willingly and openly disclose the property’s fundamentals to prospective buyers at the earliest opportunity — when the marketing begins. However, the seller’s motivation to sell sometimes has more to do with a lack of available cash for mortgage payments than a desire to incur the cost of the reports needed to market the property. In the case of a financially distressed seller who is unwilling or unable to obtain expert third-party reports, the listing comes with a significant increase in their agent’s risk of losing a sale due to a buyer’s disapproval of contingencies involving delayed, in-escrow disclosures. Thus, the agent has to sell the property twice: once to find out what the property conditions are that caused the first buyer to drop out, and again when the conditions are disclosed to a second buyer upfront. The seller may opt to pay the charges directly to the third-party vendors once billed. Here, the agent coordinates the arrangements for payment with the vendors. The seller’s check is, thus, payable to the vendor, not the broker. A seller who refuses to incur the cost of third-party reports on the sale of their property needs to be advised that a prudent buyer is most likely to incur the costs on the advice of the buyer’s agent. In turn, the buyer is inevitably going to use the reports against the seller as a “punch list” for demanding repairs and replacements to be completed before the buyer will close escrow. Thus, for a seller, it is best to request the reports sooner rather than later. The same advice holds true for implementing the agent’s marketing plan for sale of the property. The authorization is completed by the seller’s agent and given to the vendor to retain them to perform the referenced services. Thus, it functions as companion documentation for activities agreed to in the cost sheet.